OXFORD, Miss. 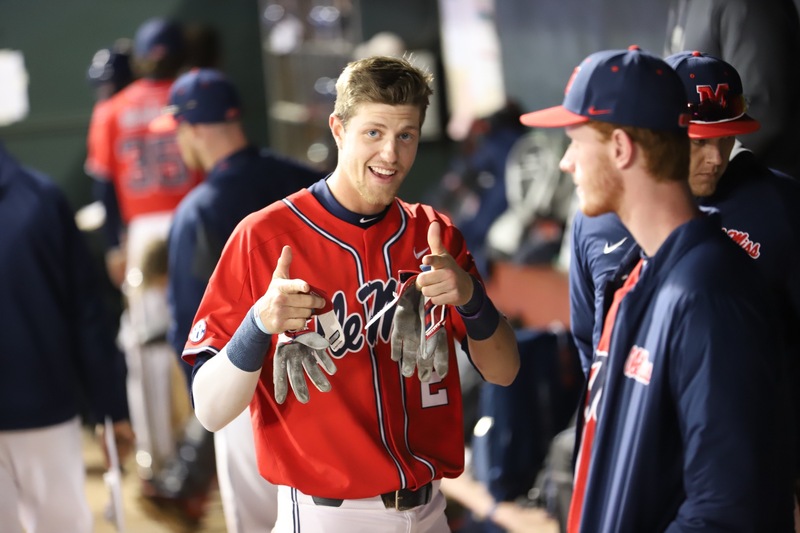 – After pulling off a nip-and-tuck win at Memphis Tuesday, Ole Miss again boards the buses and heads away from Swayze Field this weekend. The Rebels face a tough test as they head to Fayetteville, Ark., for a three-game series with the No. 8 Razorbacks. Ole Miss, ranked No. 22 in the nation, is 18-8 on the year (3-3 in the Southeastern Conference) but had to work for that 18th win in Memphis. 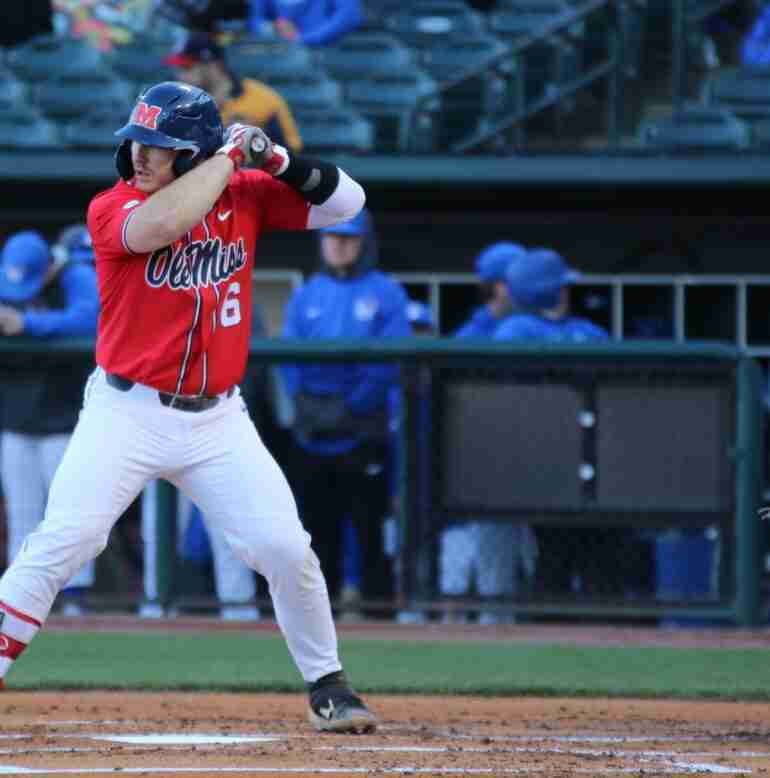 The Rebels looked as if they would roll, scoring four runs in the top of the second inning, but Memphis immediately answered with four runs of its own in the bottom half of the inning to tie the score. Ole Miss added three runs in the fourth and after the Tigers pulled within one run late, the Rebs iced the game with two runs in the ninth to earn the 9-6 win. Tyler Myers allowed one hit and fanned three out of the bullpen to earn the victory on the mound, and Parker Caracci pitched the ninth to earn his fifth save of the year. Chase Cockrell led the offense, going 3-for-5 at the plate, while Grae Kessinger and Thomas Dillard had two hits each. Now the Rebels look beyond their nearby rival and must concentrate on an SEC rival. Arkansas (21-4, 4-1) has five hitters batting over .300, led by Jacob Nesbit who is at .337. Heston Kjersted is hitting .327 and shares the team lead in home runs with Casey Martin with five. Senior Trevor Ezell is .315 at the plate and a perfect 9-for-9 in stolen bases. Christian Franklin paces the Razorbacks having driven in 25 runs. On the mound, Isaiah Campbell and Kole Ramage are each 5-0 with Campbell leading the squad with 57 strikeouts. Patrick Wicklander has fanned 37 hitters and Cody Scroggins 36. As a team, Arkansas has posted a 3.15 earned run average. At the plate: The No. 22 Rebels are paced at the plate by Ryan Olenek. 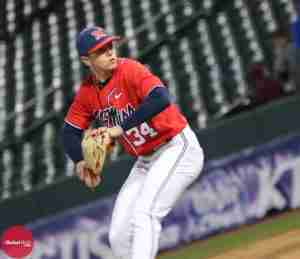 The Winter Park, Fla., native is second in the conference and leads the Rebs with a .420 average. Dillard is hitting .337 with a team-high nine home runs. Tyler Keenan leads the Rebs with 40 RBI. On the mound: Freshman lefty Doug Nikhazy has moved into the Saturday starter role and didn’t disappoint in his first weekend start and first SEC start at Missouri. He took a no-hitter into the seventh inning last Saturday and only allowed two singles as he helped the Rebels down the Tigers, 3-0, at Taylor Stadium in Columbia. Nikhazy became the first Rebel freshman to start a shutout in SEC play since Drew Pomeranz on April 5, 2008, against Vanderbilt. Friday starter Will Ethridge sports the best ERA on the team and fourth-best in the SEC at 0.71. In the final 1.1 innings against Missouri Saturday, closer Parker Caracci retired four Tigers in order with three strikeouts to earn his fourth save of the season. All three games of the series will be televised. The Friday game will air on ESPNU with first pitch set for 8 p.m. The SEC Network has the Saturday game with first pitch set for 3 p.m., and Sunday’s 1:30 p.m. start can be seen on SEC+. Home field advantage: The Rebels are 4-5 away from Oxford, while Arkansas is 15-1 at Baum Stadium. Louisiana Tech is the only team to beat the Hogs in Fayetteville. Common Opponents: Both teams have beaten Memphis this season, while in SEC play, Arkansas has swept Missouri and Ole Miss dropped 2-of-3 to Mizzou. Each team took 2-of-3 from Alabama. Back home: The Rebs’ Jacob Adams (Conway), Kaleb Hill (Pine Bluff), and Zack Phillips (Texarkana, Arkansas) are the only Arkansans on the Ole Miss roster. There are no Mississippians on the Hogs’ roster.